It’s the festive season and, with the help of the good folks at Pushkin Press, we want to offer our readers an extra treat: the chance to win all three novels in Martin Holmén’s brilliant Stockholm Trilogy! 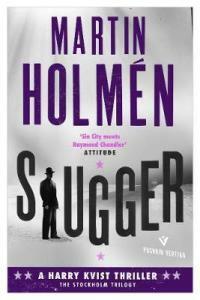 Each novel in this gritty, captivating noir series set in the 1930s in Stockholm reads as a stand-alone story, though one of the highlights of the series is how Martin Holmén develops the leading character, Harry Kvist: a former sailor and rogue boxer turned debt collector, with an inclination for aquavit and young men, who navigates the troubled waters of a down-at-heel existence in the Swedish capital’s poorer neighbourhoods. 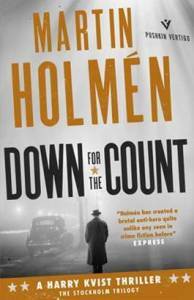 There is a lot of rough and very little smooth in Kvist’s life, but he takes both with character and dignity, and his adventures make gripping reading. 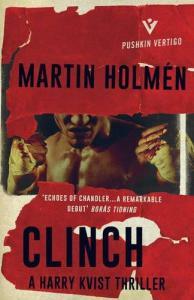 The Stockholm trilogy consists of ‘Clinch’, ‘Down for the Count’ and ‘Slugger’. 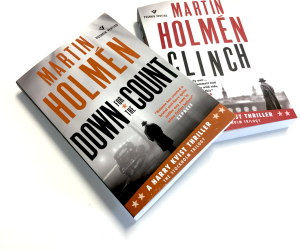 To win all three books in the series, courtesy of Pushkin Press, please click on this link and fill in the form. The deadline for entries is midnight on Sunday 16 December. Each entry will be assigned a sequence number, and the winner will be chosen via the random sequence generator at random.org. We will notify the winner and Pushkin Press will send them the three Stockholm Trilogy books at the address indicated in the form (UK destinations only please). Please note that we are GDPR-compliant, and we will not retain any of the personal information in the forms, which will be deleted as soon as the winner is chosen.